Dina Kowal Creative: My Sweet Petunia and Visible Image! My Sweet Petunia and Visible Image! I'm a guest of My Sweet Petunia on a beautiful blog hop today featuring stamps from Visible Image - I really enjoyed playing with these new and unique stamps, and I hope you'll enjoy my creations as well as the others in the hop! 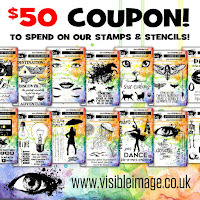 Keep reading for more info on how you can win your own Visible Image stamps, or a MISTI! If you've been hopping already and you've come from Elisa Ablett's blog, you're doing just fine. I've had ColorBox Premium Dye Inks all over my desk this week so I've used them on all my cards here as well! For this card, I watercolored the jellyfish from the Dare to Swim with the inks, then laid the Fibres stencil over it to dry for a subtle pattern in the water. I added a few circles from the Jazz It Up set after the panel was dry, and die cut some small circles into the panel so the sparkly base could show through. For my second card, I did some smooshing with the inks to create a background, then stamped the sentiment - using the MISTI allowed me to stamp it two or three times for a really intense black. The piano border was stamped twice end to end; using the MISTI I was able to line up the stamp perfectly so I could move the card down and extend the border image. I stamped right onto the background, then used gesso and colored pencil to fill in the white keys. This card sort of evolved as I went - I knew I wanted the circles around the end of the trumpet, so I set up a little template in my MISTI with a 3" die cut square, marked the corners of the opening on my card panel, then stamped and rotated to fill the space. The musicians are stamped with Versafine ink (again, multiple impressions for a perfect image), and then embossed with clear powder so they stand out even more from the background. 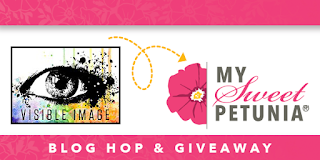 Two lucky commenters from the hop will win one of two prizes: a $50 shopping spree at My Sweet Petunia or a $50 shopping spree at Visible Image! Be sure to leave your comments no later than Monday, April 30th, at 11:59 PM Central time. 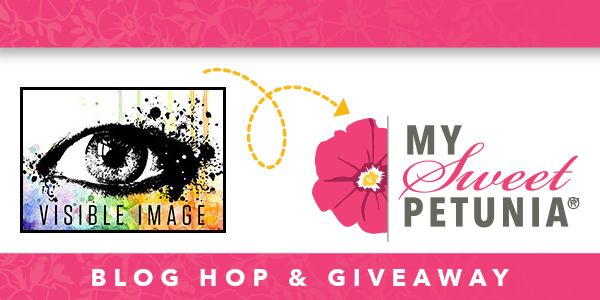 Winners will be announced on Tuesday May 1st, on the Visible Image and My Sweet Petunia blogs! Good luck! From here you'll be hopping to Heather Mitchell's blog - thank you for visiting me! If you get lost or want to start at the beginning, you can find the entire hop list below. Cheers! 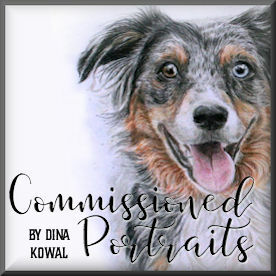 Dina Kowal -------------------------- YOU'RE HERE! Wow you have been busy. These are gorgeous! These cards are all AMAZEBALLS, Miss Lady!!! 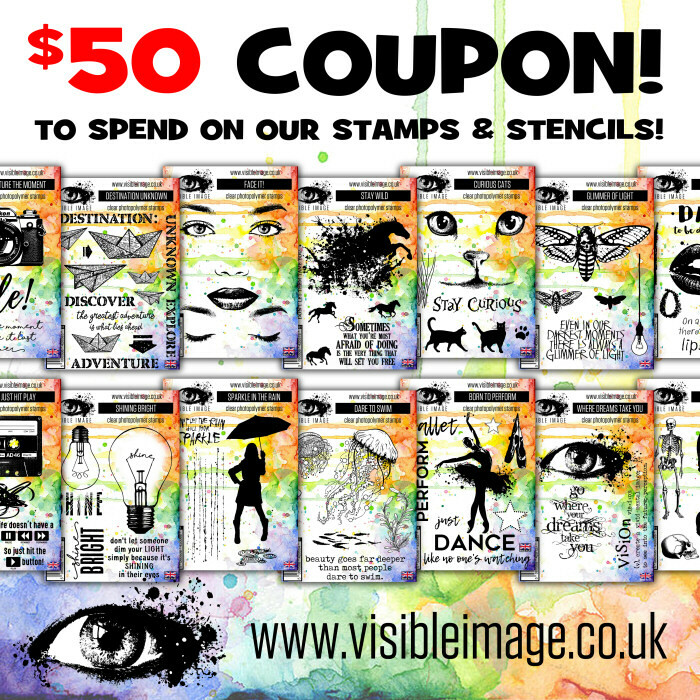 Fab cards, really lovely backgrounds to showcase these awesome stamps! these are so much fun. love the color and style!! I love the effect of the bubbles. You don't mention it, but it looks like you enhanced the bubbles maybe with colored pencils once your background was set? Hi Nancy! I actually 'masked' the bubbles before painting the background, using a Sakura clear glaze pen. Belles créations, je suis fan et cherche depuis longtemps le tampon avec la frimousse du chat.. pas évident de trouver en France.. j'aime beaucoup les fonds aquarellés, cela met les tampons en valeur ! Fabulous cards, beautiful colors and amazing backgrounds. So gorgeous. You've always known how to create the most luscious, inky backgrounds and these designs are no exception. I absolutely adore all of your makes. Wow! Awesome cards and colors!!! Really fabulous designs!! Love them ! Wow... these are all so beautiful! Love all the layers of stamping you've used! 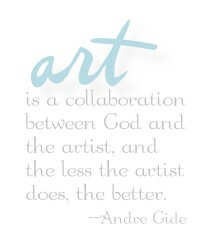 Dina, your work is ALWAYS BEAUTIFUL! I LOVE EACH ONE of your cards! The first for the colors & the image- It gives a feeling of swimming right on your card, SO COOL, & the sentiment!LOL What is NOT to like? Your second card, The sentiment is something I live by.... And I LOVE piano music as well. And the third with the jazzy players, STRIKING IMAGES & a FUN way you did them! ;) SUPER JOB on this hop!!! ;) THANK YOU DINA!!! LOVE your cards...fabuous colours and cool designs. Your cards are striking, love the backgrounds and the sentiments I super duper love! Love how you positioned the bubbles. That is my favourite project. Your cards are so beautiful, I love the movement in the card with the yellyfish. gorgeous backgrounds for those wonderful images and sentiments! When you feel like quitting think about why you started! This sentiment really touched me! I am going through some struggles right now in my life and this touches me! Thank you! Gorgeous cards! Adore that jellyfish! Lovely cards! Beautiful colors and backgrounds! awesome...I just know you would do amazing things with those stamps!! love, LOVE, love these cards!!! Super cool cards Dina. Love the backgrounds, especially the last one with the blue layers... great black images! Your cards are beautiful ! I love your work on backgrounds. Stunning cards! Fun, graphic and vibrant. I love your yellyfish card and the bubbles on your blue musiciancard ! Oh my goodness, I love the uniqueness of these stamps as well as the cards you've made to showcase them!! Beautiful cards! I don't know how I ever stamped anything before the MISTI. Thanks for sharing your creativity. I just love these cards, the bubbles really pop up from your card! Beautiful! Really love your musicians. great background! Stunning creations, Dina! Love the jazzy players stamp and the wonderfully aquatic look you created as they are jammin'. Красивые открытки! Каждая уникальная и очаровательная! I think I need that first sentiment--love the piano one! Always enjoy your creativity, Dina. These are so pretty. These are gorgeous!!! Thank you for sharing! Love them - really great pink jellyfish. What an awesome set of cards !! Thanks for sharing your technique. Great cards...really loving the bright colored jelly fish card! FAbulous cards. I really like the one with the jellyfish.